I just want to thank you for your e-mails and your beautiful letter. We appreciate your kindness, your prayers, your sympathy, your compassion and your support. Many Blessings to you and your family as you reach out to us and the many in our time of need. This flag has been done with heart felt blessings to each of those who left us on that gracious day; and their families who are left here to be reminded of the horrific event and the place where are loved ones once stood in our lives. I just want to share with you the letter I wrote for our local newspaper "The Staten Island Advance". They asked each family to write a 200 letter tribute to their loved one of 9/11. 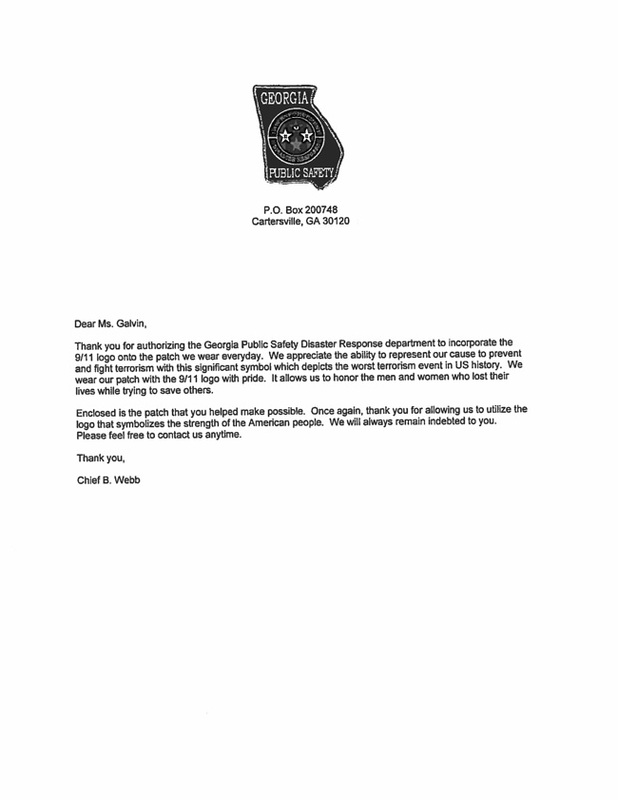 This letter will be on the front page of the paper in the month of September. With the essence of your beautiful spirit you crossed over to the other side. As the Angels came and lifted you up, they filled you with tremendous hope, heavenly glory and the love of Our Father. The peace and joy that now encompasses your soul is the same we wish you to share here with us. Your understanding is so much more now. You left here in a moment of time as God called you to do the work of the Divine. We spread your heavenly essence where ever we go; for it is truly God who knows how the whole of humanity will grow. As the light becomes brighter on the path of our journey's, we could only wish you to share it with us now as we walk it here in this Earth's School. Your wonderful spirit still fills our souls; we do feel the space where we know that it grows. Time may seem to go by but the truth of reality knows, as it was in the beginning so shall it be now. Steve & Joanne, Thank you for letting me have the opportunity to purchase one of these flags. We will fly it proudly. Sincerely, Sharon S.
Steve & Joanne Thank you for your creativity and ingenuity! Patricia H.
Dear Joanne, Thank you so much for speaking with me. My sister Michele would also be so grateful for the wonderful flag you've made in honor of her and the others who've moved on now. Many wonderful things are being created since 9/11. God Bless You. Many Blessings. Susan C.
Hi Stephen & Joanne, I received the flag and stickers today that I ordered from you. I'm really impressed with your work on the commemorative flag and stickers. 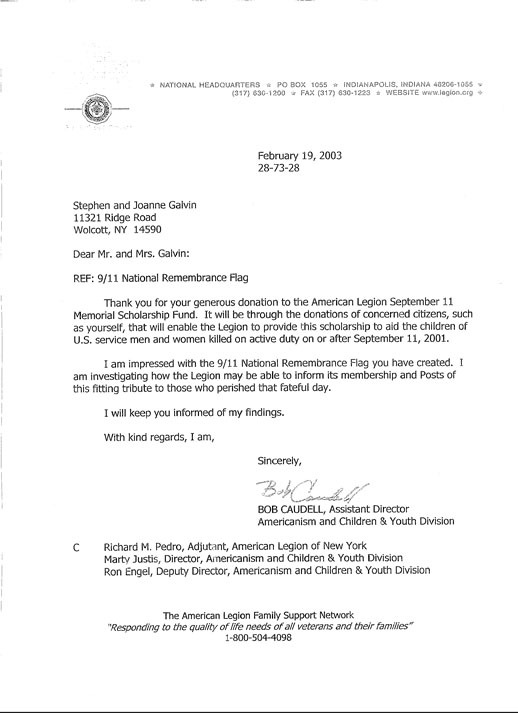 Sincerely, Richard G.
Dear Stephen & Joanne, I received my 9/11 remembrance flag and it went up the moment I got it. What a wonderful tribute you have created to the hero's of that terrible day. Sincerely, Laura M.
Hi Joanne, I am a member of the Fire Department, as well as an EMS personnel. At our monthly association meeting the proposal was given to purchase a flag for the firehouse along with a new American Flag. The response was typical of fire fighters and EMS personnel, so I will be purchasing an additional flag. Just want to say thanks to you and your husband for giving your time and energy for designing this remembrance flag and I hope that it will become an official flag. Andy C.
Dear Joanne, Very nice tribute and creative. I've seen a lot of thoughts and projects of remembrance; yours is quite powerful and nicely done. Thank you for your heartfelt creativity. Sincerely, Jennifer A.
Dear Steve and Joanne, My name is Denise T., my husband passed away in the WTC. Please tell me how much it would be to order three flags. I think they are beautiful. Thank you. Denise T.
Steve and Joanne, I was at the Stars and Stripes store in Rochester today and saw the Flag that you have designed. As they say, AWESOME. I have purchased a flag that will fly at our home. Thanks again. Jerry L.
Dear Joanne, Thank you so much for sending me the information on the flag. Of course it would be important to our family to have something such as that to display. My husband works for EuroBrokers and at that time they were on the 84th floor, Tower 2. Many of my husband's coworkers did not survive. I would like to order one large flag and 5 stickers. Again, thank you. Patti W.
Joanne, I would like to purchase a flag and several stickers ASAP. We lost our son in the WTC and would proudly fly this flag. Please let me know so that will have it by September 1. Thank you. Pat G.
Dear Mr. & Mrs. Galvin, I think the flag is beautiful. I lost my son, Kevin, that day. He worked for Euro Brokers at the Twin Towers. If you could please send me information regarding the cost and address to send a check I would appreciate it. I have 4 other children plus his wife that I am sure would like one also. Thank you, God Bless you and God Bless America. Be Safe. Sincerely, Theresa F.
Steve and Joanne, I am very much interested in the flag. I lost my nephew, Charlie, at the WTC on 9/11. He was a NYC firefighter. Please advise. Thank you. Maria A.
I know that you have a host of individuals and shows that are of the utmost importance to produce. However, I feel that I have a story that would be not only interesting, but also captivating to the American public. The story is about a couple, Stephen and Joanne Galvin from Wolcott, New York who have designed a 911 Remembrance Flag. The couple had the vision to design this flag as a remembrance and memorial to those who lost their lives in the terrorist attack on September 11, 2001. 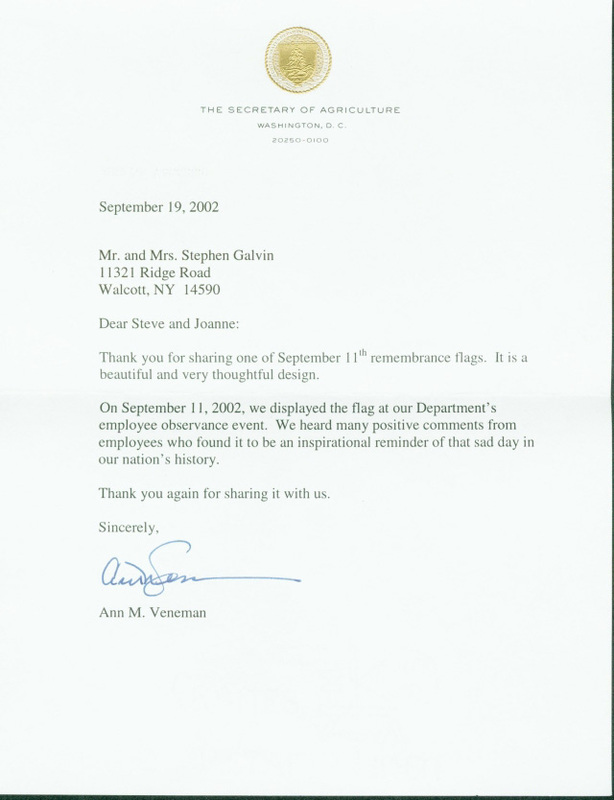 After 9/11, the Galvin's thought the best way to memorialize all the lives that were lost was on a flag. In addition, it is their hopes that this flag will become the "official" flag in remembrance of 9/11. The couple sketched a design with each color, star, and emblem representing various aspects of the unforgettable day. I have been afforded the privilege of establishing a friendship with their son Dan Fitzmaurice, who now lives in North Carolina. To hear him share with such passion about the flag leaves one in total awe. Dan informs individuals, fire departments, police stations, and military personnel in the area about the flag and it's meaning, while his parents and other family members share information about the flag in upstate New York. It is a total family collaborative effort. The flag is absolutely breathtaking, however, the meaning behind it's existence is incredibly important to the family. They are not trying to make a profit or commercialize on the event. But, they envision a flag that would be an everlasting memorial to the victims and their families. In fact, the proceeds from the flag will go to various relief efforts for families affected by the terrorist attacks. As most other Americans, I feel a great loss and I'm deeply saddened by the attack and the innocent lives that were lost. Therefore, I feel that this flag should be recognized as the 9/11 Remembrance to those who were lost in the terrorist attacks. Hopefully, this flag will be that bonding force to help families, friends, and Americans remember what happened on September 11, 2001. In addition, I feel that families must have a symbol or a means of closure for their loved ones that lost their lives tragically on September 11th. The Remembrance flag would give families a means to forever hold close to their hearts their friends and/or family member. I feel strongly about this flag because most recently I lost a very close friend of mine to cancer. Whenever I am sad and think of her, I can go to her burial place to visit and commune with her. However, those who lost loved ones tragically on September 11, 2001 cannot do that. The Remembrance flag would allow them that same opportunity that I have when I miss and want to visit my friend. I truly hope that you will find in your schedule to contact Stephen and Joanne Galvin to have them share on your show about the 9/ll Remembrance Flag. You may access Stephen and Joanne's website at: www.911remembranceflag.com. Enclosed you will find newspaper articles on the 9/11 remembrance flag. Also, enclosed are a flag decal and some vital background and contact information. Arlene Elizabeth here, the director of the World Trade Center Healing Project in California. We spoke this morning about your remembrance flag, and the possibility of displaying it at our vigil in San Francisco. As stated, I would be honored to hang your flag at our vigil, and provide information about it to participants/visitors. Please include a personal statement about how you and your husband came to design it, which we will include on our contributors wall. Thank you for your caring, compassion, creativity, patriotism, and mostly for sharing it with others to help keep the memories of those who died on that day alive. Received my 9/11 Remembrance Flag several weeks ago. I still think it's a striking piece of work. Enclosed are the photos taken 9/3/03. The flags are on a 24 foot pole bolted to my house and are lit at night. They are being flown at full staff from 9/2 - 9/10 then at half staff on 9/11. The American flag is a custom-made 48" x 91" (Fed. Proportion) from Gettysburg Flag Co. Thought you might like to see your flag on display - if you think others might too, please feel free to post these pix on your website (even the blurry night time one). It certainly is a fitting design for 9/11/01 and I'm happy to have it! I am thrilled to finally know where to get one. I first saw the flag at ground zero and I was at Shanksville last night talking to the curator who is caring for the materials left at the memorial and was describing it to her, saying that it was the only one I have seen which also remembers Flight 93. I then looked up and there it was proudly flying above the temporary memorial. The Ambassador volunteers there told me how I could get one. Subsequently, I ordered it tonight when I got home. I should say that I work for the National Park Service and am in charge of all the material that is left at the Vietnam Veterans Memorial. I have worked with the curators at OKC, Littleton, CO, and of course, Shanksville and NYC. Thanks for the Flag. It moved me when I saw it in New York and I will be proud to have one here in VA.
On Sept. 11, 2003, our nation mourned as we reflected on that tragic day two years ago and honored the men and women who lost their lives and the members of their families. The attacks of Sept. 11 were a cowardly assault upon our country and upon the sense of freedom, peace and safety we enjoy as American citizens. It is in the memory of the thousands of heroes who lost their lives that last week I presented a 9/11 National Remembrance Flag to the communities of Geneva, Manchester, Shortsville and Webster to serve as a permanent reminder of that day just 24 months ago. The 9/11 National Remembrance Flag was designed by Stephen and Joanne Galvin of Wolcott, Wayne County and it is an appropriate symbol to memorialize the victims and heroes of the Sept. 11, 2001 terrorist attacks and the courageous and ongoing response of all Americans to threats against our safety and freedoms. The flag has three bars and four stars, each representing a significant event during that tragedy. The two blue bars on each side represent the color of the State flags for each State a plane was downed New York, Pennsylvania and Virginia. A black color bar runs down the center of the flag and it represents the sorrow felt for the innocent lives from this tragedy. The four stars on the flag represent the planes that crashed and the innocent lives lost. One blue star represents the Pentagon and American Airlines Flight 77; two white stars represent each of the towers at the World Trade Center, American Airlines Flight 11, United Airlines Flight 175, and all those who perished and those who survived this catastrophe. The one red star represents United Flight 93 which crashed in Shanksville, Pennsylvania. All proceeds from the sale of these flags go directly to the families of the victims of Sept. 11. 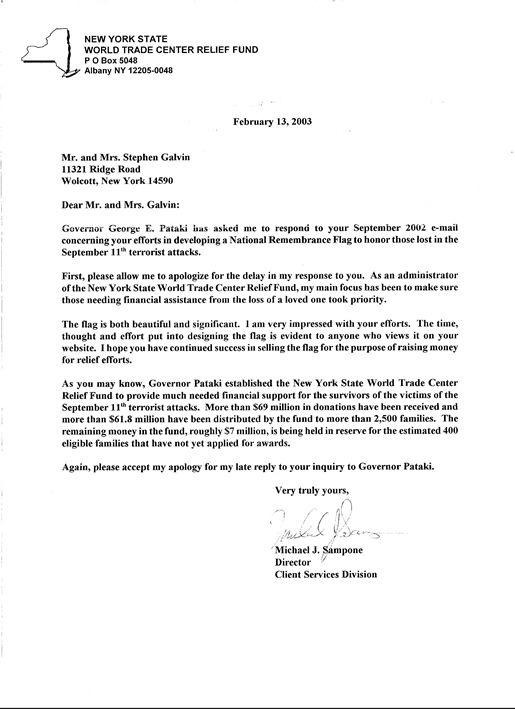 In recognition of the effort Stephen and Joanne Galvin have displayed in creating this flag, I have sponsored an official New York State Senate Resolution asking my colleagues to pause during deliberations to commend them. The resolution will be adopted when the State Senate reconvenes in Albany. It is my hope that the 9/11 National Remembrance Flag will fly above every government building across our State so that we continue to remember. Sept. 11, 2001 is a day that every New Yorker and every American will remember forever. That day we all witnessed the most horrific crime ever to take place on American soil. Our nation and state are still feeling the ravages of that terrible act of terrorism and we must continue to work together to rebuild our state and defend our nations security and freedom at home and abroad. Residents interested in purchasing a 9/11 National Remembrance Flag to fly in honor over their homes or offices, should call (315) 594-9274 or log onto the flags official Web site at www.911remembranceflag.com. All proceeds from the sale of these flags go directly to the families of the victims of Sept. 11. I just wanted you to know that I got a chance to review the material that you sent me. I must say that I am completely lost for words. This is such a beautiful and inspiring piece of work. You and your husband have truly been blessed with such a project. Now that I am aware of all this, I would be honored to have your flag shown with our 911 moving memorial. I will be taking your flag with me to the NYS Fire Science Academy to put it on display with the Moving Memorial beginning November 5, 2003. I must say Mrs. Galvin, your flag speaks volumes, just by looking at it. With your flag and our moving memorial, no one will ever forget The Ultimate Sacrifice that everyone made on that day. We look forward to working with you and your husband on such an honorable project. My father, the President of Green Hills Memorial Park in Rancho Palos Verdes, California had seen the flag when he was in Washington and asked me to search you out. He did not have any information to provide me with as far as who designed it, who made it, and where to find it. Thanks to the internet, my search is successful. We put on the largest best attended Memorial Day Observance in Southern California with 3000 plus in attendance. We have color guards from every military branch, police and fire, veterans' groups, JROTC, military and civilian flyovers, bag pipe band, Mounted Posse, dignitaries, local officals, skydivers, etc.. We are very interested in purchasing one of the large flags to have displayed at our service. I saw the web-site and know the cost but what is the probability of having that flag here in time for our event? I think it is absolutely wonderful what you have created and you should be commended for what you have done. Thank you for your devotion, your integrity, your creativity, and most of all, for giving us something to cherish and help us always remember 911 and those who died and/or sacraficed their lives. Thanks. We think your flag is GREAT! What a great design. It's the best flag that we have seen to represent ALL of the crash sites. We first saw it when we stopped at the crash site in Shanksville, PA while attending a "Thunder in the Valley" Bike Rally in Johnstown, PA. in Spring of 2002. I got a picture of it then, and since that time we have been searching and have not seen this flag anywhere. I've checked all kinds of websites for flags, and 911 things and could not find it. It wasn't until today when I did a search on Shanksville and went into a Shanksville Memorial site and found the link to your flag. If you ever make this flag in 6"x9" with a pole sleeve and/or 11"x15" with a pole sleeve, PLEASE let me know. These would be perfect for our motorcycles. Again, Thanks. And THANKS for your wonderful creation. Hi I am in the Xerox office in Saint John New Brunswick Canada. It is 7:05pm on a Friday and I decided to read the web news. I am so glad I did. I am so impressed with your efforts to get this tragic day remembered forever. I just wanted you to know that your Canadian neighbours care and also remember 9/11. I wish you every success in your important initiative. Thank you and I look forward to receiving the flags. I wanted you to know that I just found out about your efforts through the Xerox WebBoard last week, and I wanted to support what you are doing. I wish I had known about this much sooner. It's people like you that make this world a better place for us all. If I ever get my own website up and running, I would like to add a link to tell the world about your flag. In advance, thank you from the bottom of my heart for your thoughtful creation of this touching remembrance. I am writing on behalf of a retired Xerox employee, Lawrence H., who's brother Gerald H. was killed on United Flight 175. September 11, 2004 brought back to life the chilling memories of that terrible day for the family & all the families and friends left with broken hearts. Larry & Gretchen always have the US flag flying in their driveway & I know they would be honored to fly your flag in loving memory of Jerry. I would like very much to receive more information about ordering a flag for them. Please contact me with information on how to order, cost, etc. I was reading in the EDS Daily Plan-IT today about your flag creation and I just want to commend you on what you have done. As a motorcyclist I was curious if you could produce your flag in a patch so bikers could wear them on jackets and vests. Bikers are very patriotic so I could see a lot of patches being sold. Just curious and if not, I understand and thanks again for what the two of you have done not only for those impacted by 9-11 but for America as whole. I saw your flag and went through what it meant. Its perfect and beautiful. It has every color of emotion and history in it. I have signed a petition too for the flag to get official. I have also emailed all my friends and asked them to see and sign the petition and also to pass it on to all they know. I will pray and hope that the flag gets an official status throughout the world. I just read the article about the work you and your husband did in creating and producing the 9/11 flag. The article did a good job in describing what you two have gone through in producing the flag, and in the many ways it has touched the lives of a lot of people. Thank you for doing that for all the people that needed it. We must never forget what happened that day, and you two have helped us. Joanne, Thank you for sharing your wonderful story with us. The care and thought that went into such an effort is just tremendous. It's very meaningful and it will touch many people's hearts. This will be a difficult weekend for many and your story is yet another avenue that will provide comfort. I just received my remembrance flag in the mail today, and I want to let you know how thrilled I am. It is so beautiful, and I will gladly display it, and the sticker that you so graciously enclosed. My wedding anniversay is 9/11, so it has even more significance, and my husband passed away a year ago May 31, and I know that you lost your husband to cancer in 2005. I have always wanted to purchase this flag, ever since I first saw it. Of all the 911 flags I have seen over the years, this flag honors all of the fine men and women who were so tragically cut down on that fateful day. God bless the work that you and your late husband started in the effort to keep the memory of these cherished Americans in our hearts forever. I got my dates mixed up when I sent my first e-mail. I think priority will get it here in time to fly it on the 11th. I'm sorry for the confusion. I also want to take the time to tell you how good it felt to run across your web site, read your story, and watch the video. It touched my heart to see that there are still a few great Americans like you and Steve left in our country. I know very few people who exercise the meaning of love, gratitude, or respect. I want you to know that I am thankful for the opportunity to meet you and Steve; so to speak. I am also deeply touched by your decision to carry on with the project after Steve's passing. I can only imagine how difficult it has been for you to do while mourning the lose of, what appeared from your picture, to be a very loving relationship with your husband. Although I have the desire, I find it difficult to say the right words that would send comfort to you. But I think that, if it is possible, Steve is very proud of you. And, as a husband, a father, and an American; I'm very honored to meet you. May God bless you Joanne, for your courage, your loving heart, and your dedication to this cause. I got my flag from my son, Sam....and the stickers.....and the pins!!!!!!! Yesterday.......for my birthday, which is actually this coming Saturday, but he is going to be gone to Virginia for a wedding, so we had my birthday early.... THANK YOU AND YOUR HUSBAND SO MUCH FOR IT......I LOVE IT AND I WILL DISPLAY IT PROUDLY!!!!!! I received the materials I ordered in a very timely fashion. Thank you. Well, I guess I started something. So many people at my VFW are interested in your remembrance items. I think you can count on more orders. Our VFW will be hosting a national reunion on September 30th (always a great turnout of veterans from our country and I believe it is the 3rd annual such event), and I plan on promoting your materials. If you have any materials that you wish to be displayed please let me know. Printing is costly I know, so if I have your written permission to copy your brochure and business card I could supply the lodge with handouts. I will display the lovely flag on 9/11 and then donate it to my VFW. Next year I will need another for my private use. A vet talked me out of my pin so I will go to your site and order another (or more). The patch was given to a suffering veteran who collects such things and he was elated with it. I am also involved with promoting Operation Helmet. If you haven't heard of it you might consider visiting their site: http://operation-helmet.org. I'm so looking forward to receiving your beautiful flag. What a wonderful thing you and Steve have done. You must feel such reward. God Bless you both. Mary Greetings. I adore this flag. I also lost a loved one on 911. I also am opening a church soon in CT and I wanted to obtain a lot of flags to hang in the new building to represent various important symbolic issues. This one is vital. I was wondering, if you all could donate one of these 3x5 flags to me for my church to honor all of those whom lost loved ones on 911 like myself? If so, it would be greatly appreciated. Thank you for your consideration and God bless you. I was in Shanksville PA at a country store when I saw them. This is special: I was in NY 1 year anniv., in DC 2 yr anniv. And PA 3 year anniv. When one completes the triangle this flag is very, very deep. I am a Midwest gal who needed to get out of Minnesota and experience what I could of this story live. The only missing piece is a touch of Canada. They helped us when the United States of America was restricted for 4 days. I want to do this Canada 4 yr anniv. I can't wait to receive your package. My mom wanted the flag and some pins for her birthday. The hard hat stickers are for me. I love the design. Your husband must have been a wonderful man. I went to Iraq with the Marine Corps and I took 9/11 personally, thinking of our loss everyday. Its good to know that there are others who will never forget the cowardly act that took so many great people's lives. Thank you for touching our lives down here in Tennessee. I look forward to proudly displaying the items soon. I just want to also give my condolences on your loss, I also loss my brother Ed C. in the world trade. I had purchased the previous flag you had three years ago, this will be my second one that I hang on my balcony. Thank you. God Bless. Thank you. We are a 9-11 family. We lost our cousin Michael Tammuccio in tower 1, and my nephews fiancee's uncle Mike Esposito FDNY Squad 1. Again thank you, God Bless. Hi Joanne, I'm Pete's sister. I live in a small community in upstate New York. My highschool classmate and friend, Bonnie Ames, was lost in tower 2 that day. It touches me to think that thanks to your efforts and my brother's with this beautiful flag, Bonnie and all the victims of 9/11 will never be forgotten and will always be in our hearts. Thank you. Dear Joanne, I received the 9/11 flags and items in the mail. They are beautiful. I had to sit for a moment and just take it all in. I think the flag and items are an outstanding tribute to the family's and respectfully pays tribute to those who lost their life's on 9/11. Thank you for the charm and additional items you invluded. I will let you know how I made out with my Local Union. I also talked to the Ashton Family (what a beautiful Family) they were very happy to hear about the flag and website. Colleen Ashton (Tommy's sister) asked me to give you her phone number and email address she would love to speak to you about the flag. Maybe you can make it down to the tournament next year and present the flag to the Ashton family at the tournament, that would be great. Thank you again and I will speak to you soon. Hello, My colleagues and I will be in Washington, DC on Sept 11 and we wanted to show our support some how while visiting the city and we thought wearing matching lapel pins would be appropriate. I cam across your website - what a wonderful show of support you are doing. We would need 50 pins and I was wondering if there is enough time for them to be delivered to me by Friday, 9/8. Thanks so much for your help. Nicole R.
Thank you so much for the new patch. It looks great! I am going to send it to our son in Baghdad. I hope you have received orders from our various patriotic groups by now. Many people have asked about your materials. I even got three motorcycle groups interested. Some even asked about t-shirts that include "Never Forget" on them. I will put in a small order today. Would you include a few more business cards with the order? I pass out pins to our returning soldiers. Hi, I am a police detective who worked at the site after 9/11 and my University in CT is doing memorial on Monday and if at all possible (YES I will pay for it), can I get Overnight shipping so I can have the wonderful flag flying during our ceremony. I would appreciate any help you can provide in this matter. Please call me or email if you need anything else from me. 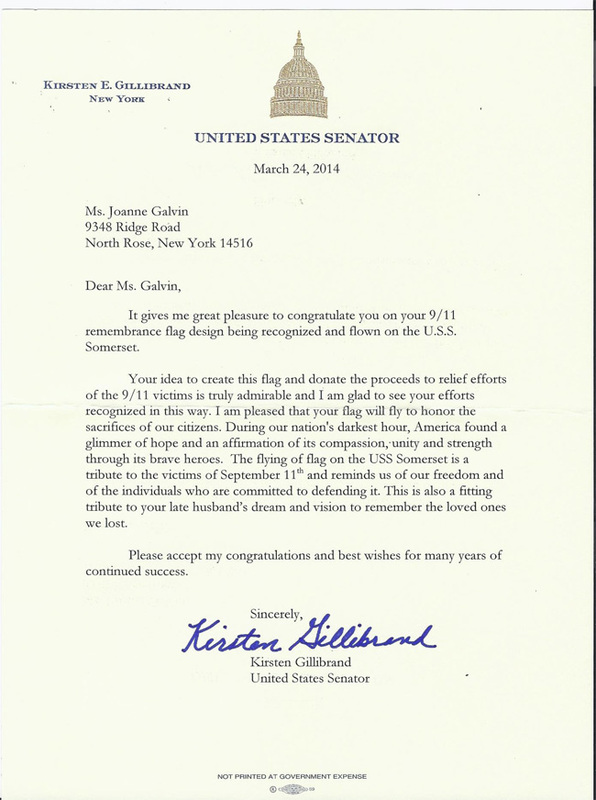 Joanne, Text of request I made to my senators here in NJ: Why has there been no adoption of an official Sept 11th flag? I note the legislation adopting the POW/MIA flag as a precedent for such a move. The people of this country need this symbol. We cannot/should not ever forget this event that marks a new chapter/era in our country, one which will require a resolve that can be measured in few tangible ways by common citizens. A flag would at least allow us to mark our steadfastness and resolution. Hi Joanne, I actually wrote to my two senators (New Jersey) and the President yesterday asking why we didn't have an official flag and how it was necessary and how the precent of the POW/MIA flag should clear the way for its adoption. I also sent a copy to my brother (Missouri) and his sons (cadets at Virginia Tech), asking for feedback. I'll keep thinking on this as far as other contacts. The town next to mine (Scotch Plains), Westfield, built a memorial, as several citizens were killed. I'll try to find out who spearheaded their efforts. I found your flag while looking to buy a remembrance flag that I could put in front of my house. I searched "9/11 and Flag and Remembrance" on the web. I know the retail aspect is dicey, as one comes close to the border of commercialism vs. memorial. Another consideration is the benefit of exposure in getting the message of the flag out to the general public and garnering more support to get the flag adopted. Just a thought. I am a member of Local Union #3 IBEW New York City. We lost 17 members in the WTC. I have sent my order to you for 2 flags and other 9/11 items. One flag is for my house and one I would like to donate to my local union hall. I would also like to talk to the family of Tommy Ashton, a Local #3 apprentice who lost his life at the WTC on 9/11. The Ashton Family just completed the 4th annual Tommy Ashton 3 on 3 basketball tournament on May 19th and 20th 2006 at St. Sebastian's Parish Center in Woodside Queens where Tommy was a lifelong resident. The family donates all proceeds to the St. Sebastian's School Library and Parish Center. I will try to work out a flag for the Parish Center with the family. Please send me some order forms with my order so I can give them to ther members. Thank you and Kindest Regards. William P.
Hi Steve and Joanne, The pins arrived this morning and they are excellent, thank you. Thank you too for the diary, a very pleasant surprise and a thoughtful one. I like yourselves have in my own way tried to help the relatives and loved ones of those that were lost. I am a serving British Police Officer and in both 2002 and 2003 I came over (together with nearly 400 other Police Officers in 2002 and 130 in 2003) at our own expense and time to stand with our Brothers at ground zero on Sept. 11th. We raised a considerable amount of money which was donated to the Police families funds by selling a Pin badge called the Badge of Courage. I will try and acquire one for you and send to you. I met a considerable amount of New Yorkers who were very thankful of our presence and to be cheered and clapped and receive a salute as we left Ground Zero is something that will remain with me forever. I am looking to come over again for 9/11 next year and maybe we could meet up. I will try and spread the word of your efforts here in the UK and if I can be of any help please feel free to contact me. Thanks for your nice return mail. I do appreciate the detail you gave me on the funds and I think you are on the right track working with the Legion. I'm sure it gives you comfort to know that the dollars are not getting caught up in bureaucracies and maybe not going to appropriate places. 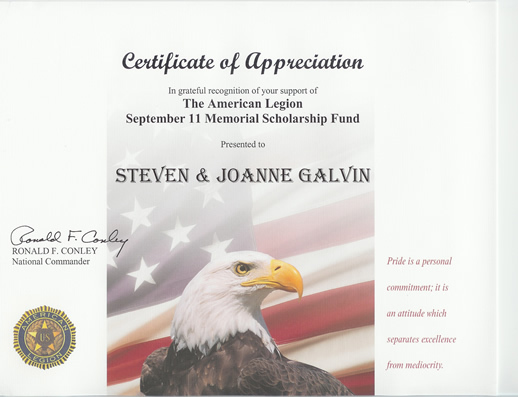 I think the Legion and the VFWs are organizations who really have a heart for those who serve our nation and the scholarship program seems very noble. Considering that those soldiers on the front lines are probably no rolling in excess money it seems right to help their kids in the event of their death while helping serve our nation. I can only imagine how touching it must be to have correspondence from loved ones who were ffected by 911. God works in mysterious ways and HE has a unique way bringing good out of tragedy. The relationships the two of you are developing with folks from around the country are a testimony to that and the fact that we need to bear each others burdens. I'm sure you have been in the right place at the right time for somebody and I'm sure as time and God continues to heal the wounds of hurting people there is more to come so just stay ready and be encouraged you are doing what's right. Take care and God Bless. Doug N.
I wanted to thank you for offering such a terrific flag to commemorate 9/11 in our hearts and minds. I just placed an order for another 9/11 flag. This is the second flag of yours that we have purchased. The original, purchased in July of 2003, has flown in our yard on our 22 foot flagpole almost every day since then (a few VERY windy ones we had to take down). We even installed a flood light so it could stay up 24 hours a day. Looking out our window, seeing that flag, topped by the stars and stripes, stirs powerful emotions. Living in New Jersey just 12 miles from Ground Zero, 9/11 was a day we will never forget. Just last summer, my brother-in-law married a 9/11 widow (her husband was on the flight from Boston that hit the towers). Her strength is a tribute to the souls lost. Thank you again. I am sure you will hear from us again. Hi Joanne, My name is Suzanne, and I wanted to inquire about the use of your flag. I was in my friends store taking picture of some of her flags to make up note cards to retail in her business and thought your 9/11 flag would be great to use as well. I don't know what I need to do to use it, or maybe I can't. Can you be in touch with me to let me know what permission I need to go forward? Thanks for your time. I would also be glad to make a portion of the proceeds to go towards your program. GREAT FLAG. Joanne, Just want to update you on the 911 flag you so kindly donated to our church auction. The auction was held last night and a fireman and EMT bid $75 and got the flag. They will proudly display the flag at the White Springs Firehouse here in Geneva. Again I can't thank you enough for your donation. Joanne, I received the flag today. It is very nice and much better quality than I expected. Most flags I buy for holidays and remembrances are not made to withstand long or repeated periods of exposure to the elements (in other words they are cheaply made). I am impressed by the materials and stitching. It shows your respect for its meaning. Thank you for the sticker as well. Thanks Joanne, I was hoping to get them by 9/11. Every year I have planned to get something like this to show that I remember those we lost that day and have always let it slip my mind. Finally this year I was able to think about it and saw your flags. I thought there were the most appropriate of any that I saw. I am looking forward to getting it and flying it during this time of the year to remind people of the loss we suffered on that day. So many have forgotten what all we lost that day. I hope that I never get that way. Thanks again for the speed shipping. I will be proud to fly it. I left my job as a police officer, and now serve to make sure that it never happens again. God Bless you and your efforts. Dear Joanne, Special tribute to you and your dear late husband for designing such a "heartfelt" flag. It speaks volumes. I saw the story about your flag on channel 10 news. My son in law is a member of the Morrisville fire dept. and I thought he would like to have one. I will not be purchasing the one the Governor picked out. I think your flag is much better. I did find the website and have purchased one. Thank you for writing me back. Laurie T.
Joanne, It is a very good thing you are doing by designing such a flag. I have no ties to 9-11-01 other than being a Proud American but would like to honor those who died that day by flying a flag in remembrance. Deb G. You are a good person Joanne...your flag will be flown at my house...thank you for all your effort "God Bless America"...God Bless You. Hi Joanne, Just wanted to let you know I will be on the dock of the USS New Jersey in Camden, NJ on 9/11 and will be flying your flag proudly and below the flag my TRIBUTE corvette will be displayed. Joe S. I live in Wisconsin, and a co-worker from NJ forwarded an e-mail to me this morning, containing a picture of the flag. I thought it was beautiful. He was working on 43rd St. in NYC on 9/11 and we have kept in touch over the years. I remember calling him immediately after the news broke here just to hear his voice. He was ok, but told me how he was watching everything out of his office window. I wasn't there physically, but emotionally we were all there on that day. Now every year on 9/11, just simply send him a message telling him I'm thinking of him because I know how deeply affected everyone still is on this day. Even though we're 1000 miles away we all feel the pain. Robin S.
I am writing to request your permission to use the picture of your remembrance flag for 9/11. I was a long distance operator during that time and I had to work that sad day. I felt the hurt and pain. I belong to many MSN groups that do things in paint shop pro and I am asking if I can use the picture to make tags with and to use on my desktop as wallpaper. I know it has been some time since you have heard from me. I never "officially" received your email until tonight. We have been having all kinds of computer problems caused by literally hundreds of "Pop-Ups" that prevented us from using our computer. During our recovery phase, someone moved all my incoming mail to my filing cabinet where I found your document tonight. I read about your offer for the remembrance flags and would be honored to receive them. I feel that your design BEST relays the significance of remembering the events of 9/11. I know I will proudly fly mine on the front of our house. The small sticker that you sent me is already on my car. I will contact my wife's school to determine whether they will fly the flag in September or not. As you can imagine, sometimes there are issues of "political correctness" when you deal with public institutions and they sometimes have to say NO even though in their hearts they want to say YES. When I stumbled upon your website a few months back I was seriously considering designing my own pin or flag to represent the injured survivors from 9/11. As you can imagine, it has been a very difficult 2 and ½ years and a rather painful one both physically and emotionally. If you go to the Department of Justice's website for the Victims Compensation Fund you will read that there were over 4300 injured individuals that have survived to this date. However, what you do not see is that there were only approximately 30 seriously injured out of those 4300. These were the only people who spent more than 3 days in the hospital. There were 39 burn victims for both the Pentagon and WTC of which only 19 of us survived. Most of the 4300 were individuals that were treated for eye irritations or immediate breathing problems because of the dust cloud. NONE of the surviving firemen were burned on 9/11 even though that is the VERY FIRST questions I am asked every time someone finds out I was burned in the attack that day. I spent 3 weeks in the hospital (about the middle of the pack of 30) and have undergone 7 major skin graft operations to date with more to follow. Sometimes it is very difficult to accept that I am "the lucky one". There were times in the first 3 to 6 months that I wish I had perished with some of my friends. This leads me back to my topic of designing a pin for the injured survivors. With the exception of a few major cases (Lauren Manning of Cantor Fitzgerald) for one, we have been a forgotten group by EVERYONE. Even the media has repeatedly stated, "either you lived or you died" that day. So the book has closed for many of us but the horror goes on. Depending on where you live, you are lucky if you can find any support groups especially if you live in Suffolk County like I do. We need something to pull us together as a group and I thought that a "very limited edition," numbered, gold or silver pin, distinctive of that day (Pentagon and WTC) would be a nice thing for the injured. Do you have any thoughts on the subject? What about if you offered your Remembrance Flag or pin in color or metal commensurate which the trauma suffered that day, and made this available ONLY to families that have registered with the Red Cross, etc. Yes I know I have anger issues and yes I am getting some help. This would be a major step toward my personal recover and other individuals recovery as well. Oh, by the way, I will be contacting you to order some more stickers for my car and boat as well as a smaller flag for by boat antenna. I insist on paying for these items and will contact you through your website. Your generosity is already over-whelming and I thank you. Hello Joanne, I am unsure if you remember me but I was the DJ at the wedding in Vermont a few years ago. I have been proudly wearing the pin at work as a paramedic and firefighter and would like to know if you would mind a little help with getting the word out about your flag. I have placed orders from time to time for pins and stickers for some of my coworkers. I would like to start a group on Facebook and see how many votes we can get to help in getting your flag approved as the official flag for 9/11. I want to do this for you because your flag means a lot to me and it is very important that we have a way to remind people that they should never forget. I have already set up the page, if you want me to delete it just say so. I just wanted you to know what I was working on. Take Care. Dear Joanne, This is Glenn - 9/11 World Trade Center Volunteer Search, Rescue, Recover Operations Team Worker. Joanne, I want to thank you from the bottom of my heart and soul for the beautiful gifts you have sent to me. They mean so much to me, and I wanted to ask you if I can help in any way to push this beautiful flag to be the New York State Flag. I would have no problem writing to Governor Cuomo and anyone else that you need to have this passed. As soon as my financial matters are better, I am going to order that beautiful 9/11 Flag. Also, thank you for sending me this information, I was reading it on line from Mr. John Feal and here you are sending it out to me. Thank you, I am very very grateful for your compassion and hard work you are doing for the 9/11 families. I will say a prayer on a daily basis for you and your family, to ask God to help your family heal together. May the Good Lord keep Steve by your side every day. Your friend in peace and harmony, may God bless each and every one of us. Bless this country and especially our heroes the troops. The flag came today and I've already got it flying in front of my house. Thanks for the quick shipping. Thanks also for the small stickers. I'm planning on putting one on my fire helmet at work and I've already got one of the larger ones on the back window of my car. Iâ€™m really happy with the flag and appreciate you taking the time to supply them and all the other things you do in remembrance of 9/11/01. I look forward to flying the flag each year around this time to show my respect for those who gave so much that day. What an honor! I am so happy to hear that your flag is touching the lives of so many. Our Spirit of Kindness Club will be presenting your flag to Manheim Township High School in Lancaster, PA next week. One of their alumni was one of the heroes that died aboard Flight 93. This school in our townshipâ€™s school and my 1 step son graduated from there and the other is currently a senior there. It will truly be a privilege to present them with the flag to honor jean, who died about Flight 93.